Peaches are native to China and were known as “Maotao” or “Yietao” and were considered a Chinese symbol of immortality and friendship. When the Romans began consuming peaches, they believed that peaches came from Persia and they called them Iranian apples. 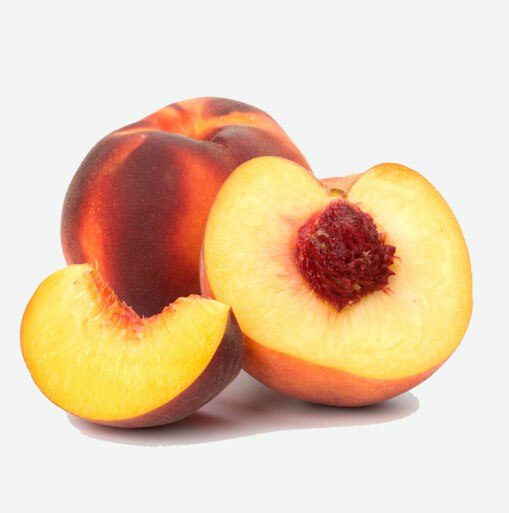 The name “peach” comes from the Latin word meaning Persian – prunus persica. Famous French painter, Renoir, encouraged his students to improve their painting skills by practicing their painting and reproducing the textures and colours of peaches. A medium sized peach serves up a huge amount of nutrients such as vitamin A which helps to fight the effects of aging. It contains vitamin B, folic acid and vitamin C which are necessary for a healthy functioning nervous system. Besides being a great source of nutrients, peaches are a great source of fiber and they are low in calories for those who are watching their weight. One medium-size peach contains a mere 37 calories. If these gems of summer aren’t ripe, store them in a paper bag, but remember not to pile them on top of each other or bruises will appear. If ripe, peaches may be stored in the refrigerator for up to a week. For full juicy succulence, bring them to room temperature and then enjoy both their flavour and aroma. Remember to wash them well under cold running water and gently pat dry with a paper towel. Choose peaches that are firm with a smooth skin and sweet aroma, and avoid ones that have wrinkled skin, a greenish hue at the end, or are excessively soft, bruised or blemished. Overripe or extremely soft peaches should be used immediately and can be cooked. To make peeling easier, bring a pot of water to a boil and immerse the peaches for 45 to 60 seconds. Peaches are versatile and delicious and can be cooked, canned, dried, pureed, boiled, roasted, or made into jam. Their best flavour and nutritional benefits are derived from enjoying them fresh and whole, fuzz and all! Peaches are delicate fruits which bruise easily, and should be handled with care. Keep sliced peaches from browning by tossing them lightly in lemon juice.